Junk and Rubbish Removal Services in Utah. 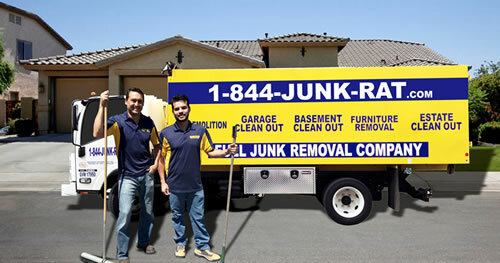 At 1844-Junk-Rat – junk and rubbish removal in Utah is made easy… because we do all of the work! 1844-Junk-Rat.com understands that being environmentally friendly when disposing of your commercial waste is important to your business image. Our highly trained professionals can work with you to assess the streams from which your waste initiates and formulate a junk hauling and recycling plan that works for you. In Utah, we are the junk people and take pride in our customer satisfaction. Our rates are affordable, and we go above and beyond to ensure you are satisfied. When our staff arrive, all you have to do is direct us to the area your junk is stored, we will do all of the work, heavy lifting and sorting so your time can be spent organizing the space you always wanted. Scheduling with 1844-Junk-Rat.com is done in a way that fits your schedule so your experience will truly be stress free. Have you ever upgraded a old computer lab? Well let me tell you cleaning up is no easy task. Knowing the issues of trashing old electronics in mass, we looked to 1844junkrat.com/ to help us with a large scale Computer Recycling project. Contacting their office was easy, unlike many companies; the person on the other end was able to speak with me at length to understand the scope of my project so that there would be enough people on hand. The professionally dressed and polite crew arrived to the lab on time, happy, and well prepared for the Computer Recycling task at hand. Over the space of three hours, the 1844junkrat.com/ guys organized, removed and sorted all the electronic for later recycling. I though the job would cost a pretty penny so I was really happy when were charged a moderate but very affordable rate for the task. Great company, I see nothing but good things for them in the future.